When Revealed: Deal 1 damage to each exhausted character. Until the end of the phase, each damaged character gets -1 Willpower. Shadow: Deal 1 damage to the defending character. Until the end of the phase, the defending character gets -1 Defense for each damage on it. When Revealed: The opposing team searches the top 5 cards of the encounter deck for a card with cost 2 or less (3 or less if there are two or more players), sets it aside, and shuffles the encounter deck. Reveal the set aside card. Its 'when revealed' effects cannot be canceled. 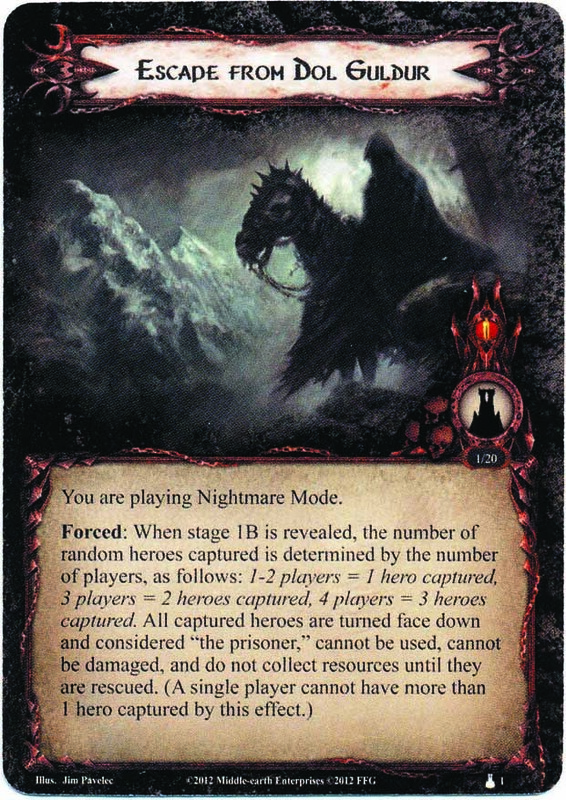 Forced: After the players have committed characters to the quest, discard cards from the top of the encounter deck until a treachery is discarded. Reveal that treachery. If the players defeat this stage, they win the game. When Revealed: Shuffle the encounter discard pile into the encounter deck. Each player discards from the top of the encounter deck until he discards an enemy, adds that enemy to the staging area, and attached a hero he controls to it as a guarded objective (discard all tokens from the chosen hero). If there is an unguarded hero in the staging area, return it to its owner's control, exhausted. This stage cannot be defeated while there is a guarded objective in play. If the players defeat this stage, they win the game. Rider of Mirkwood's engagement cost is considered to be 0. The number of damage tokens on Rider of Mirkwood cannot exceed the number of progress tokens on this stage. Players cannot defeat this stage while Rider of Mirkwood is in play. If the players defeat this stage, they win the game. 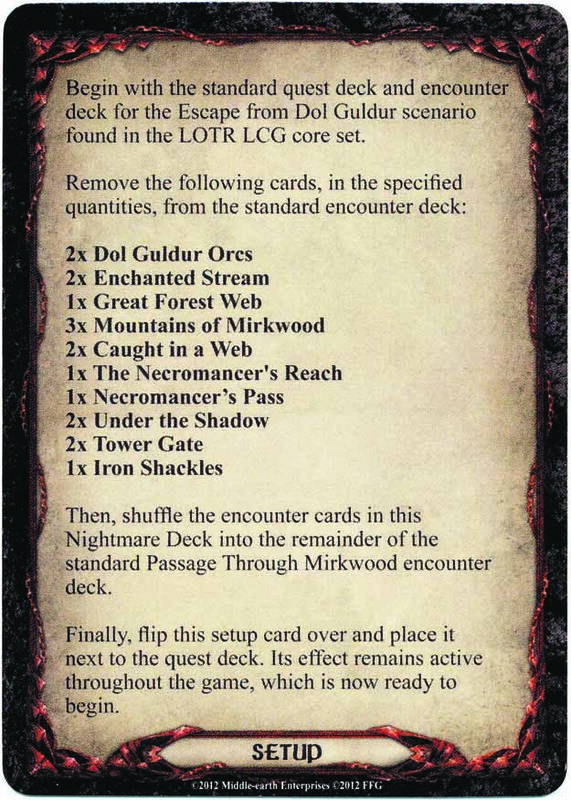 Begin with the standard quest deck and encounter deck for the Escape from Dol Guldur scenario found in the LOTR LCG core set. 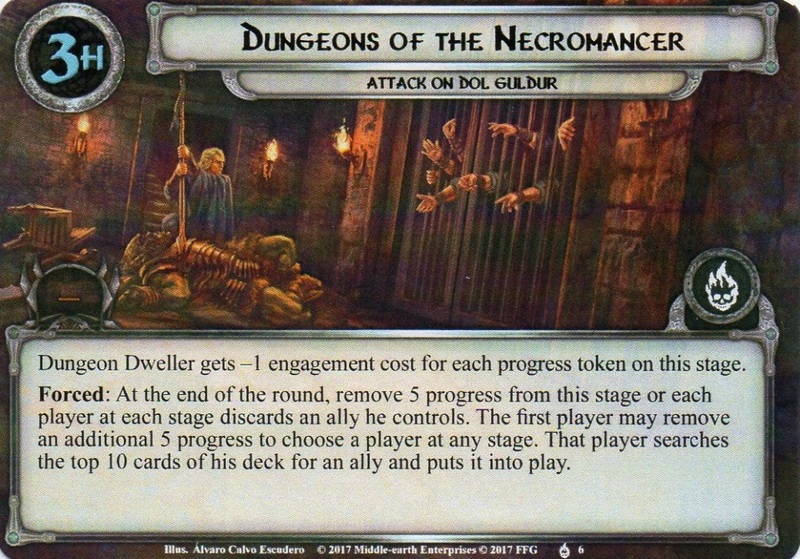 Remove the following cards, in the specified quantities, from the standard encounter deck: 2x Dol Guldur Orcs 2x Enchanted Stream 1x Great Forest Web 3x Mountains of Mirkwood 2x Caught in a Web 1x The Necromancer's Reach 1x Necromancer's Pass 2x Under the Shadow 2x Tower Gate 1x Iron Shackles Then, shuffle the encounter cards in this Nightmare Deck into the remainder of the standard Escape from Dol Guldur encounter deck. Finally, flip this setup card over and place it next to the quest deck. Its effects remain active throughout the game, which is now ready to begin. You are playing Nightmare mode. 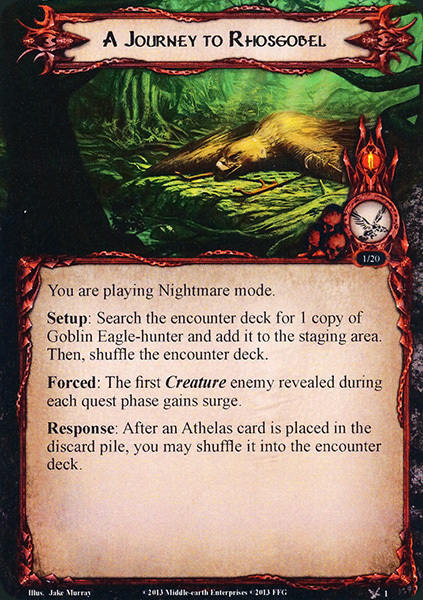 Setup: Search the encounter deck for 1 copy of Goblin Eagle-hunter and add it to the staging area. Then shuffle the encounter deck. Forced: The first Creature enemy revealed during each quest phase gains surge. Response: After an Athelas card is placed in the discard pile, you may shuffle it into the encounter deck. Begin with the standard quest deck and encounter deck for A Journey to Rhosgobel scenario. 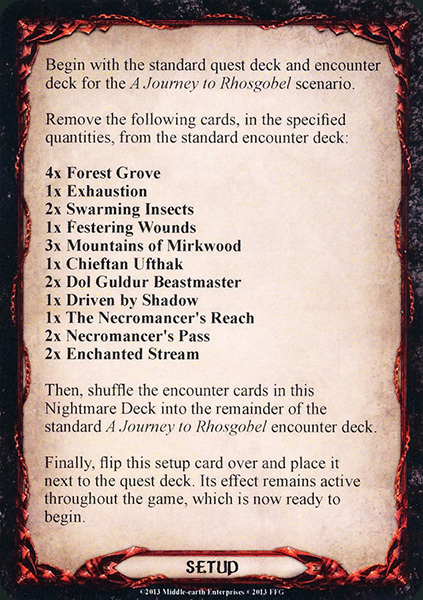 Remove the following cards, in the specified quantities, from the standard encounter deck: 4x Forest Grove 1x Exhaustion 2x Swarming Insects 1x Festering Wounds 3x Mountains of Mirkwood 1x Chieftan Ufthak 2x Dol Guldur Beastmaster 1x Driven by Shadow 1x The Necromancer's Reach 2x Necromancer's Pass 2x Enchanted Stream Then, shuffle the encounter cards in this Nightmare Deck into the remainder of the standard A Journey to Rhosgobel encounter deck. Finally, flip this setup card over and place it next to the quest deck. Its effect remains active throughout the game, which is now ready to begin. You are playing in Nightmare mode. No more than 1 progress can be placed on each location in the staging area each round. 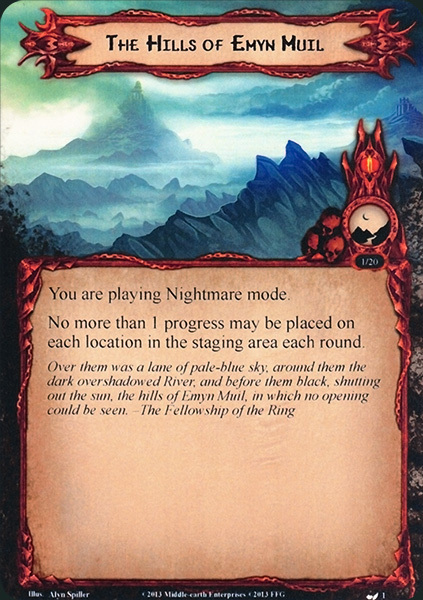 Begin with the standard quest deck and encounter deck for The Hills of Emyn Muil scenario. 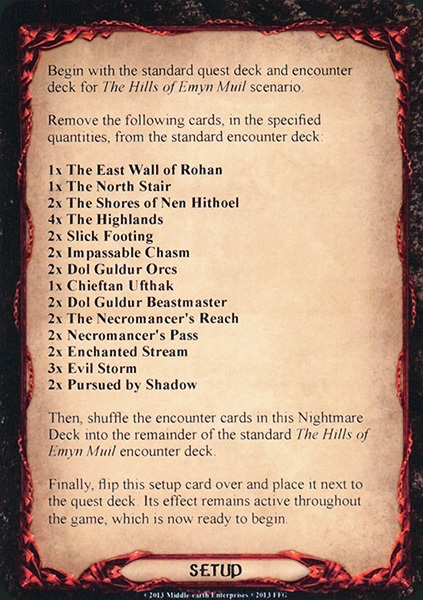 Remove the following cards, in the specified quantities, from the standard encounter deck: 1x The East Wall of Rohan 1x The North Stair 2x The Shores of Nen Hithoel 4x The Highlands 2x Slick Footing 2x Impassable Chasm 2x Dol Guldur Orcs 1x Chieftan Ufthak 2x Dol Guldur Beastmaster 2x The Necromancer's Reach 2x Necromancer's Pass 2x Enchanted Stream 3x Evil Storm 2x Pursued by Shadow Then, shuffle the encounter cards in this Nightmare Deck into the remainder of the standard The Hills of Emyn Muil encounter deck. Finally, flip this setup card over and place it next to the quest deck. Its effect remains active throughout the game, which is now ready to begin. 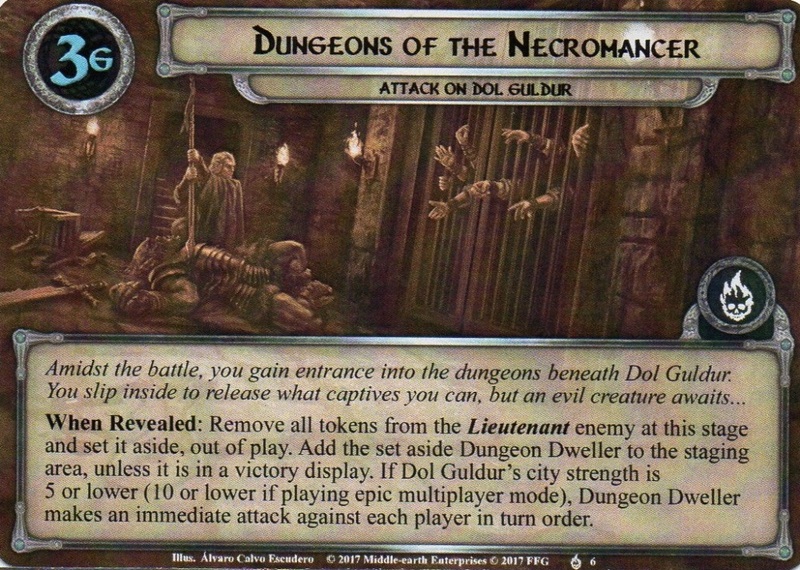 Forced: When Necromancer of Carn Dûm would attack you, instead reanimate the top card of your deck and deal it each of the Necromancer of Carn Dûm's shadow cards.